I will introduce you to "The Girls". Some have been named and their personalities are evident by their character. I did not know how the raising of chickens could be so entertaining. We started our chicken adventure in early April with the purchase of our first four chicks that we obtained from our pastors wife. 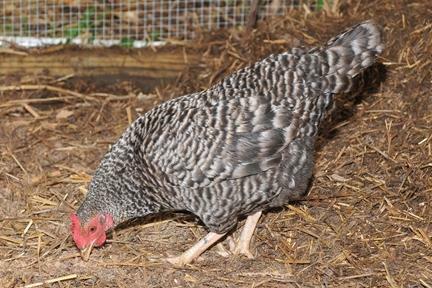 After just a few days of watching the chicks grow and chirp, we decided to jump all in and kick start our fun with the purchase of a few hens from the local auction. 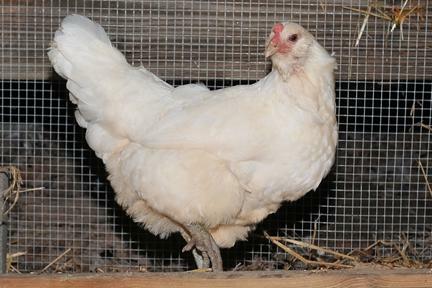 Our first addition was a white Americana. We were in hopes of the pastel egg but later found that she produces a beige egg. We use these for our own consumption daily. This is Lucy, she thinks she is the queen of the roost! We followed this aquistion with a few Golden Comets and of the five that we obtained, we have given two away so we have three left. 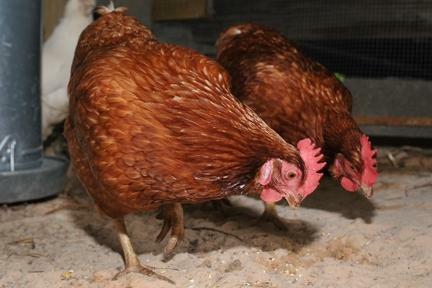 Scarlett, Marigold and Goldie. We were still looking for the Pastel eggs so we purchased Bella, she is the Auricana in the crowd. No eggs from her yet, but we are waiting to see if she can do it. This is Bella keeping an eye on the crowd below. Speaking with my father about his chickens from his youth, he recalled the Domineckers that he had so I figured I would honor his memory of his chickens by getting one of my own. 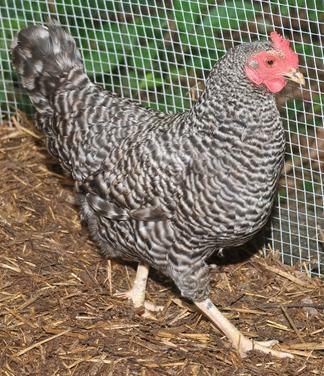 This hen is young and has not been named yet so if you have a suggestion, let me know. I have not seen any distinctive character traits from her yet. Being the new kid in the coop she is getting picked on by the others. I hope she can hold out from the pecking order ritual! I am sure when she matures she will have a thing or two to say to those who picked on her as a young hen! 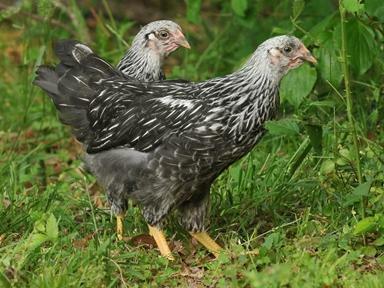 We have the four Silver Laced Wyandotts that are ten weeks old now. This is a picture of a couple of them at 8 weeks old out exploring the world. "This is two chicks, not a two headed-three legged chick! Next in the pipe line are the youngest chicks. These are about a month old now although the image was when they were a bit younger. They are soon to be set out to the coop for introduction to the rest of the family, I just need to figure out how I am going to keep them seperate from the others for a while first so they won't be pecked and harrased by the others so bad. They are supposed to be all Golden Comets however I think one of them may be a different breed. We are looking forward to raising the new chicks and always appreciate the tokens of appreciation the hens leave for us each day. This is the "Coop-de-Ville" as I refer to it. 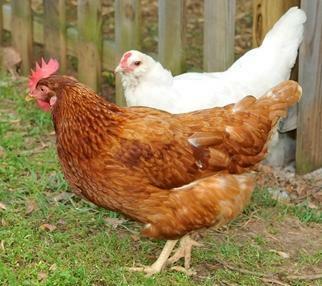 The chickens feel right at home here and return every afternoon when they finish their walk in the wild each day. 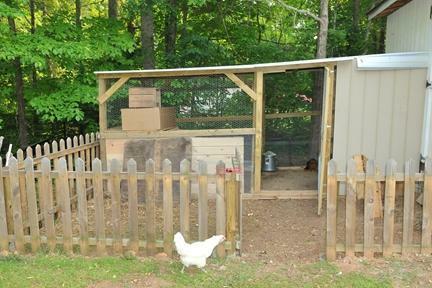 This is the coop and their fenced in yard with Lucy rushing to get back in. 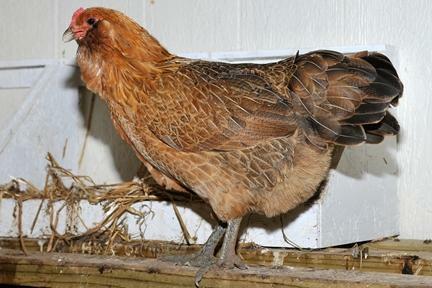 It must be egg laying time, she sure looks like she is in a hurry! 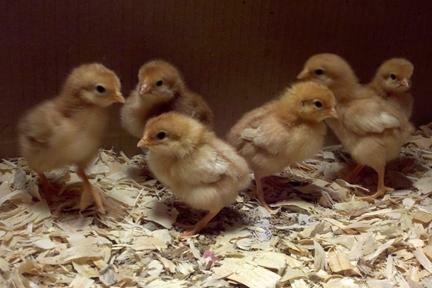 I hope you have enjoyed the introduction to our Chicken Family.